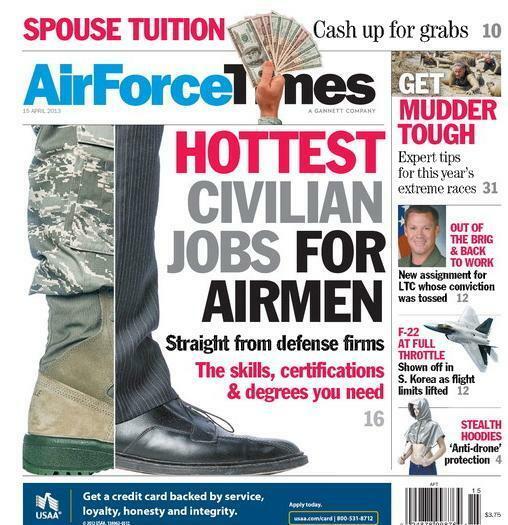 If you’re preparing to enter the private sector, then you want to check out this week’s cover story about which jobs defense firms are looking for and how you can get them. We provide a list of the AFSCs with transferable skills in the civilian world and what degrees and certifications you need to land a job at one of the 10 companies we spoke to. Also in this week’s edition: A New York City-based fashion designer has come out with a hoodie and other clothing that will help you avoid detection from unmanned aircraft. It’s the latest thing if you want to make a statement while not being seen by orbiting UAVs. In money news, many of you have suggested cutting Tops in Blue to save money. Now, the troupe has canceled its 60th anniversary tour for six months due to budget cuts. Meanwhile, professional military education classes will continue for now, but Air Education and Training Command is waiting to see whether budget cuts could cause PME programs that require temporary duty assignments to be canceled. The tough fiscal situation has also caused air shows to be canceled, but now the air show industry is fighting back by hiring a lobbying firm to explain to Congress how much money they bring in for local communities. And if you’ve ever wondered why firefighters don’t get Hazardous Duty Incentive Pay, you can read what has happened since Congress authorized the pay for all military firefighters back in 2005.